How do you say goodbye to friend that has practically been family for your entire life? How do you put into words the joys and pains that have been shared? The Civic Arena has been an icon of the Pittsburgh landscape since 1961 and is as beloved as the Incline or Point State Park. But alas, her time has come to an end. However, this is not a time for sadness or remorse, but for celebration. The Igloo has been a part of the lives of every Pittsburgher whether a Penguins fan or not, and remembering the good times and bad, the highs and the lows, the wins and the losses, is the best way to keep our beloved arena alive long after it has gone. I remember my first trip to the old Civic Arena when I was around 14 years old. It was a Pens/Maple Leafs game and we had great seats in section C right near center ice. Of course in the late 80's it wasn't difficult to get seats like that. But the sights, the sounds, and the atmosphere were amazing and I was immediately hooked. These are the types of experiences that lend young people to dreaming of a pro career, or, sometimes a future at a top sports management college. I was still fairly new to hockey, but I knew right away that I loved this game and this arena was my temple. The Pens lost that game, but to me it didn't matter. I remember the greatest hockey game I ever saw in person. Mario Lemieux put on the greatest individual performance in the history of the NHL on December 31, 1988 when he scored five goals each of the five possible ways they could be scored. I was sitting up in section E and had no idea that I was witnessing history that very day. I still have my ticket from that game; although I wish I still had the program where I kept track of the stats of the game. I remember going to the arena for a minor league hockey game featuring the Muskegon Lumberjacks. We got tickets right along the glass in one of the corners, and it was incredible. I really didn't know who any of the players were, but they were affiliated with the Penguins so they were my team too. We banged on the glass and heckled the other team and acted like fools. I'd say that's what kids do, but if I had the chance to do it tomorrow, I would probably act the same way. But this old arena has seen more then just hockey games. It has been the home to numerous concerts, events, and other sports over the years. The Igloo has been the home to everything Pittsburgh had to showcase and it represented it fabulously. I remember going to the arena to see the Pittsburgh Spirit play as part of the Major Indoor Soccer League. It was different from anything I had seen, but it was still exciting and fun. The sound of the ball banging off of the end boards when a shot would go wide was deafening, but a sound I still loved to hear. I remember the carpet that they played on not always staying in place and wondering if the ice was actually still below. I remember seeing the Pittsburgh Bulls playing as part of the Major Indoor Lacrosse League at the arena during one summer when I was in high school. The biggest highlight of the game though was when they opened up the roof of the arena part way through the game. I had always known about the roof opening, but had never seen it myself, and to be inside the building and watching a game with the roof opened was something I will never forget. I remember when the arena became a movie star and helped Jean-Claude Van Damme save the Vice President from the bad guys. It certainly wasn't a great movie, but I still watch it every time it is on TV just to see the Pens and the Igloo. And, of course, to hear Steigy swear as all hell breaks loose. As time passed I grew up, went to college and left the city that is my home and the arena that is my temple. But I have never forgotten the memories of the beloved arena. My only regret is that in recent years I was unable to return home and visit the Igloo one more time to relive some of the cherished times I had there, and to make one more Mellon Memory before it is gone for good. But alas, that time has passed now and I am left with the stories that still make me smile. The new Consol Energy Center will be amazing indeed. It will be the best arena in the league by far and will be embraced by the city of Pittsburgh. But just like you never forget your first car, or the house you grew up in, or your first love, I will never forget how much a part of my life this arena has been. 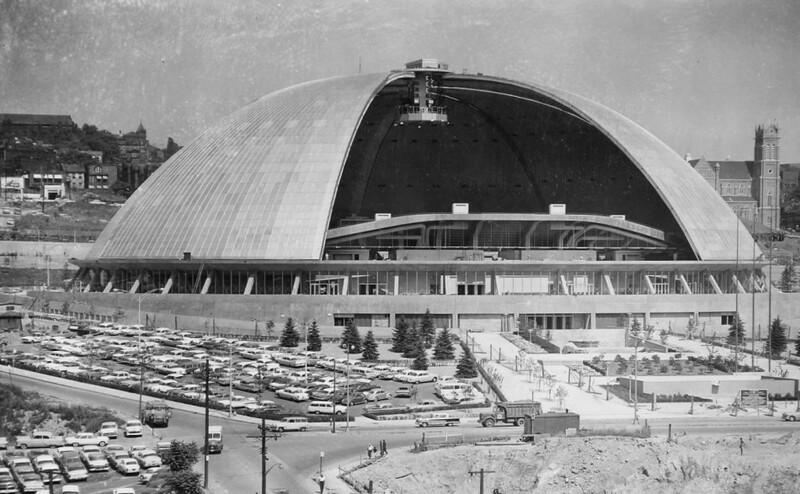 Like Forbes Field and Three Rivers Stadium, the Mellon Arena will live on in the lives of future Pittsburghers as well. Passed on from generation to generation, the stories, like mine, will live on in the young fans and the new home that they will make theirs.